A door makeover for you today. 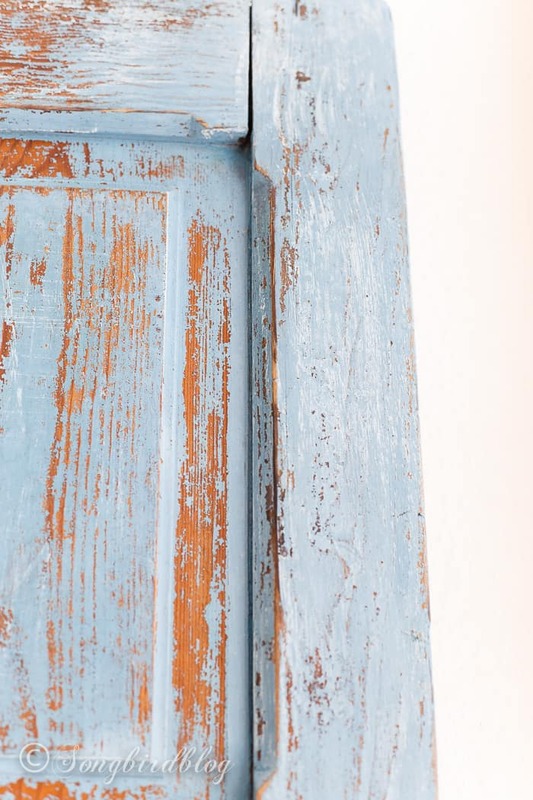 A milk paint door makeover that turned out to be perfect chippy goodness. Hello my sweets. How is life treating you? I am happy and sore. Happy because I just had a long weekend and it was such a nice long weekend. Sore because we started on the first stretch of a 500K long distance hiking trail that we are going to do with friends. We did 15 K for the first stage of this journey . I was fine for the first 12 and than everything started to hurt. Still lots of muscle ache now. Ah well it just proves that I really need to move more, and that waving around a paint brush is not exercise. I am really looking forward to this hiking adventure though. I think there are about 26 stages in the track, it will take us from the most southern tip of the Netherlands (very close to my home) to the outmost northern tip. The landscape will be diverse but mostly flat. We had a bit of hill last Sunday and I think the next stage will have a hill or two and than we will be in flat Holland country side. Lots of woodland, sand dunes, polders and moors will be waiting for us. I am sure I will get to see and get to know parts of my country that I would otherwise never ever see. We have not set a time-frame in which to finish the stretch but we have good intentions…. Of course this will mean I will have to start to train a bit more in between as well. Because this stiffness and soreness after a mere 15K is kind of confrontational and lets say embarrassing too. What is not embarrassing is this latest project I did. I turned out as a bit of a surprise for myself too. But a very happy surprise. My door makeover project turned out fabulous. Remember that one wardrobe door I painted about a year ago (or a bit longer)? Well all that time I had the sibling of that door standing in the basement, unpainted and neglected. The other day I took pity on it and decided to give that door a makeover and slap some paint on it. Marian aka Miss MustardSeed gave me some milk paint to play with and I thought this was the perfect project for it. And I definitely stepped out of my comfort zone and decided to go for a color instead of my usual white. I went for French Enamel blue, and boy do I love it. The painting was fast and easy. I mixed up the milk paint and just slathered it on the door. Not much prep beforehand just the removal of dust and cobwebs. I gave it two coats. After painting it I took the door outside because the lighting in the basement is horrific and I had no idea how it was actually looking. Well it was looking good, but as with the previous door, the paint was uniform and very well adhered and a bit too dark for what I had in mind. So while I still had some white paint on my brush from another project, I gave the door a very light dry wash with white. I don’t know what happened next. If it was that white paint dry wash treatment, if it was the combination of outside sun and maybe even a bit of mist from the rain (the door was lying underneath our roofed terrace), or just the marriage between the milk paint and my door. At first I freaked out, because it was not what I had expected. The other door hadn’t shown any chipping at all. And then I embraced it and loved it. And decided to work with it. With my hands I carefully brushed away the loose chips and then I sealed it all in with one coat of very clear varnish. In the picture above you can see how the French enamel and the white paint and the chippyness have all married together in one lucky, beautiful union. And then the most wonderful thing of all happened…….. I brought the door inside to protect her from further damage from the elements. I didn’t really have a place for her in mind, so I leaned her up against the only bit of bare wall I had in my living room: in between the hutch and my ‘mantel’. Lucky moment nr. one: it looked perfect there! But even more wonderful: I caught my guy looking at it and then he said “wow this door really turned out great, I love what you did with it!”. Coming from a modern design loving man, this was a very unexpected and high compliment indeed and I didn’t even have to fish for it! I guess miracles really do just happen…. And on that bomb shell…. It does look perfect there! It’s beautiful and next to the blue jar, what a perfect detail to enhance it. Beautiful! What is that large round woven mat that you have on the wall next to the door? Did I miss that from a previous post somehow? I love it! STUNNING! Best surprise ever! I could be so lucky to mess up that well! haha Seriously LOVE this project! Ahhh…this looks like a door to somewhere. Not like a basement stored left over door you decided to paint one day!! I’m not a chippy gal too often but when I saw this I thought,”Oh Marianne is going for an old Skandinavian/European country look. !” I thought how well it went with all your white. Truthfully if it had been solid blue I do not think I’d like it as much! Funny huh? The touch of an antique lidded canning jar and what I call winter daisies ( but the snails are dreadful and eat mine) draws my eye to the mantel and door. Yes!! Creativity plus!!! As far as hiking goes. Will you go for me? Pretend my legs are able to climb heights and keep practicing. Do Epsom salt bath soaks work? They do restore magnesium Not sure if that helps hikers but let’s just say it does!!! I recently painted some pieces in the French Enamel and totally fell in love with the color. It looks gorgeous paired with all of your white. I’ve got a couple of old doors I want to paint, and I think I’ll try your chipping method … leave them out in the elements for a few days! If mine turn out half as fab as yours I will be happy! 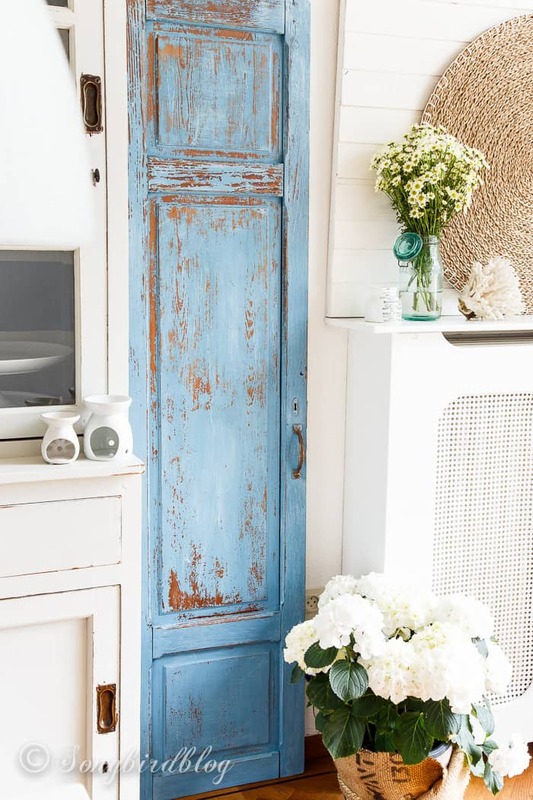 Love, love love the French Bleu door….it’s so perfect with at The white. Beautiful! The French enamel blue works perfectly against the white! I love it.